At ICS we spend a considerable part of our budget on research to remain on the forefront of thought-leadership. We believe in sharing our thinking through various publications and have written a number of books, some of which are listed below, and published a long list of academic articles on the subjects of our expertise. A selection of our internationally acclaimed research can be downloaded here. Bjartveit, S. and Roos, G. (eds. ), Scandinavian Perspectives on Management Consulting, Cappelen Akademisk Forlag, Oslo, Norway, 2005. Roos, G., “National Innovation Systems and Strategies and their Relationship to Defence and Security Research” in Sünkel, H. and A. Vogel (Hrsg. ), “Wissenschaft Forschung Landesverteidigung, 10 Jahre ÖAW-BMLV/LVAK”, Kommission Für Die Wissenschaftliche Zusammenarbeit Mit Dienststellen Des Bundesministeriums Für Landesverteidigung, Projektbericht 7, Verlag Der Österreichischen Akademie Der Wissenschaften, Wien, 2005, pp 112-123. Apart from this sample, we have a number of publications on IC disclosure which is not listed but which can be provided on request. 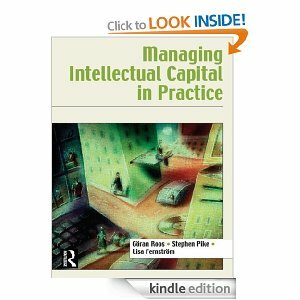 Burgman, R. and Roos, G., “Empirical and Structural Evidence for the Increasing Importance of Intellectual Capital Reporting: Implications for the European Community and European Companies”, Journal of Intellectual Capital, Vol. 8, No. 1, 2007, pp. 7-51 — The most downloaded article from JIC in 2007. Also in the Top 20 of Most Downloaded Articles – by Immediate Impact from JIC.